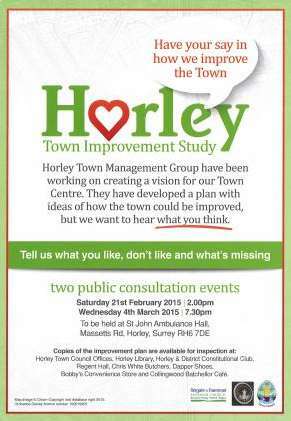 Have your say in how Horley is improved. 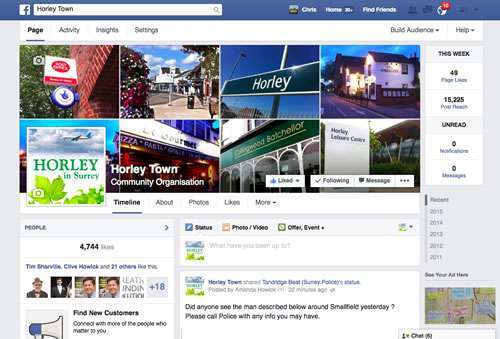 The Horley Town Management Group have been working hard on creating a vision for the centre of Horley. A study has been developed with ideas how the town could be improved. 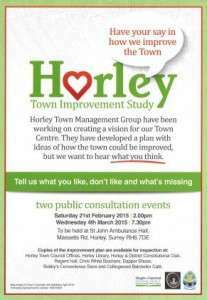 Now the Horley Town Management Group want to hear what you think. The Improvement Study is now published as a document. Click here to read it as an online book. Copies are available in the Horley Library, Horley Town Council Offices, Horley & District Constitutional Club, Regents Hall, Chris White Butchers, Dapper Shoes, Bobby’s Convenience Store and the Collingwood Batchellor cafe.